There are many factors driving the development of European Union (EU) foreign policy. 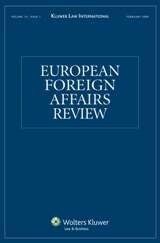 While much of the literature focuses on how particular interests, norms or internal processes within Brussels institutions, this article sheds light on the role of external factors in shaping EU foreign policy through an in-depth examination of the recent development of EU Arctic policies. The authors of this article, published in European Foreign Affairs Review, find that increased Russian aggression, not least in Ukraine, is key to understanding why the EU recently has taken a strong interest in the Arctic. In a more insecure environment, Member States are more prone to develop common policies to counter other powers and gain more influence over future developments, especially as it relates to regime-formation in the Global Commons. In effect, the EU demonstrates a kind of reactive power when it comes to dealing with new geopolitical threats.